Covered Call Screener | Identify high yield covered calls. If you are unsure what a call option is, or a covered call, then please check out the What is a Covered Call? page for a more in-depth explanation. At the close of each market day, the OptionsBuddy crawler analyzed data for all optionable common stocks traded on the US Exchanges and stored it in a database. As a member of OptionsBuddy.com, you had the ability to create custom portfolios that enabled you to filter stocks and options based upon your own risk criteria. In July 2013 OptionsBuddy was acquired by the internet's leading covered call web site, Born To Sell. 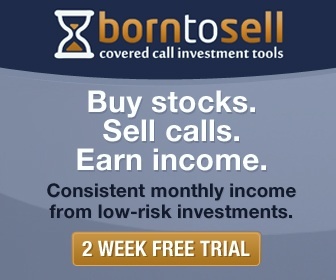 If you'd like to see the covered call screener, please visit http://www.borntosell.com or take the tour. © 2015 Born To Sell, LLC. All Rights Reserved.